Here's another copy of that picture from my Photo Friday: FAMOUS blog entry. This is the one that I keep put away with fond momentos from days gone by. 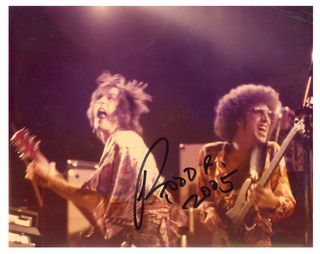 As I mentioned in an earlier blog entry I shot the concert picture in November 1974. The neat thing is that I finally got that picture (and a few others) autographed in May 2005. 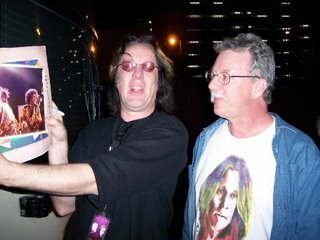 After 31 years I was in the right place at the right time to finally meet Todd Rundgren in person, share a couple of laughs, and bug him for a few autographs. On that earlier blog entry Mark Martin (not the race car driver!) had posted a comment with just two words....."1974" and "sheesh". 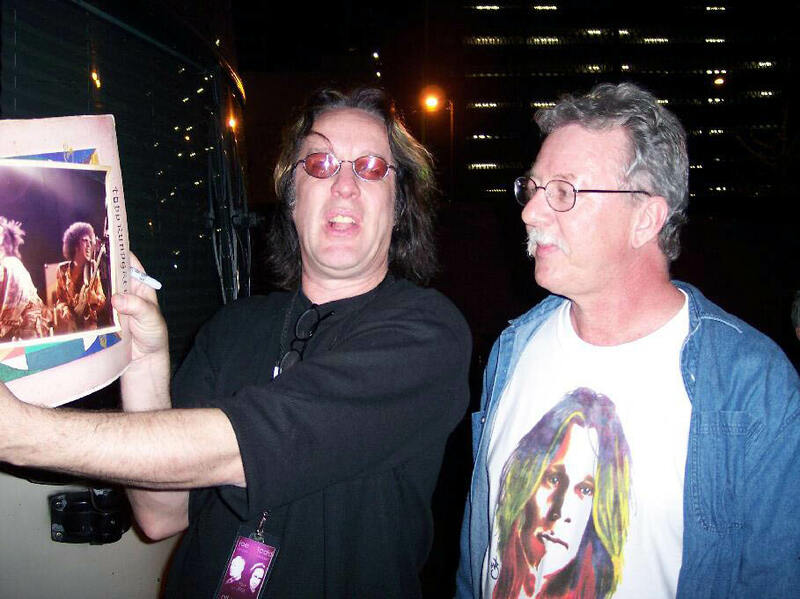 That got me to thinking and one of the thoughts that I had was of the first time that I saw Todd Rundgren in person. Guess who I went with to that show? Mark Martin (not the race car driver!). Mark, do you remember that? I have these vague memories of setting out one bright November day in 1973 in a Volkswagen Beetle piloted by Martin Muzer. I don't even rember the passenger in front seat but I do remember that Mark Martin and I were crammed in the back. Martin pushed that old VW down I-20 towards Tuscaloosa and the University of Alabama much harder that he should and the thing quit running somewhere just outside of Vance, Alabama. We spent a very uneasy hour or so wondering if we were going to make it to the concert but fortunately for us Martin's older brother Jeff had just started to UA a few months earlier and he drove out and got us to Tuscaloosa on time. I had a fantastic evening, shot lots of pictures, and somehow made it back home. Anyway, I've rambled to this point just to try and jog my own feeble memory. Help me here Mark! Who was that fourth person in the VW? Where is Martin Muzer these days? Do you even remember that day? Am I remembering it all correctly or is my memory playing tricks on me? I wish I had the memory that my sister Janet has. As Todd Rundgren once said ".......take a few of these, sweeter memories......"
Riding to Tuscaloosa, Alabama in a VW Beetle driven by Martin Muzer. Enjoying a Todd Rundgren concert. Not worrying about how we were going to get home. My memory is worse than both of yours*. I had forgotten it was that Todd Rundgren concert. The thing about that night that is forever burned in my memory is being crammed in the back of Jeff Muzer's car and having to pee so bad I thought I'd die, and that sadistic b------ would not pull over! I don't remember how many miles that went on before we finally got to Leeds, I just remember agony. I blame Jeff Muzer for my damaged bladder! *especially Janet! You poo-poo your memory just like you poo-poo your talent, but both are sharp. I don't know what happened to Martin M. But here is how I would find out if you really want to know: Contact Chuck Thomas if you can't find Jeff. Then, of course, you can call Jeff! After you talk to Chuck and get his number! Assuming Jeff and Kathy are still married. Then you can say "What the heck ever happened to Martin?" I just remembered - that was the day Martin yelled "RUN! She's gonna BLOW!!!!" as he bolted from the beetle! I don't know about you, Ardell, but that phrase is part of my lexicon! Thanks for the replies, Mark. I actually "belly-laughed" when I read that last comment. I had forgotten that one little detail but the minute that I read it I could see Martin running doen the side of the freeway. We all just stood there for what seemed forever waiting for the VW explosion that never came. And on another note; I believe that it was in fact Chuck Thomas that went with us. All of this was just a bit odd in that I rarely ran with you three guys. I have a memory like your sister Janet, and I want to clarify that I was the student at UA, not Jeff! Also, my brother Chuck said it wasn't him with you guys. You rode home with our friend Walter Burton, who complained to us for months about our forcing him to take extra people home after a night of hard-rocking! I think a lot of people slept at our apartment that night. I had to go to class the next day and couldn't remember a thing! I left college at the end of the semester, not to return until after the birth of our three daughters (now 20, 25 and 27) at the age of 40 to become an English teacher of all things (NO, not like Mrs. Holt!!) You have quite a way with words Ronald, and Mark, I'm going to see your website - Chuck and Jeff say you are great, as usual. It has been great reminiscing with you guys! I enjoyed the photos of Todd R.
PS Our youngest daughter enjoys attending music festivals like Bonaroo (this year and last) and the New Orleans Jazz Festival (before it blew away) with her boyfriend who sings and plays guitar (his website is pauljaneway.com) - check it out, she (Marissa) sings with him on "Streetlights." We still love music! !